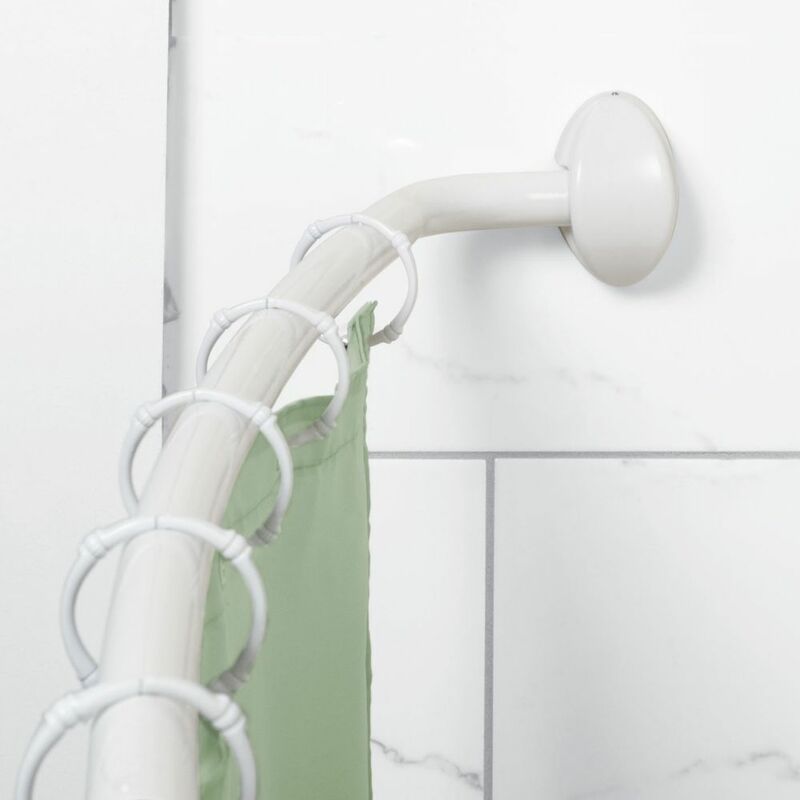 The Zenna Home Adjustable Curved Shower Rods innovative design provides an extra 8 in. of elbow room in the shower. This hotel-style shower rod is easy to install and will fit any opening from 38 in. to 63 in. The rod provides a quick way to add an elegant look and extra room to any shower area. The American Standard Multi Collection Satin-Nickel Shower System Kit includes a soft hand shower, hose, wall supply and a 24-inch standard slide bar with adjustable bracket for hand shower. It is constructed of brass for dependable, long-lasting use. The lightweight hand shower has 3 functions that can be switched at the flick of your thumb. The adjustable shower holder can be positioned anywhere along the bar and can be angled up to 450. The Griipa Utility Hook is an amazing new hanging device that you can apply to smooth, flat, shiny surfaces without tools, adhesives or fasteners. It is far superior to suction type hooks in its holding power and versatility. Curved Shower Rod in White The Zenna Home Adjustable Curved Shower Rods innovative design provides an extra 8 in. of elbow room in the shower. This hotel-style shower rod is easy to install and will fit any opening from 38 in. to 63 in. The rod provides a quick way to add an elegant look and extra room to any shower area. Curved Shower Rod in White is rated 1.0 out of 5 by 1. Rated 1 out of 5 by DenniDee from Worst Shower Rod I Ever Purchased I purchased this rod with the only exception being that mine was chrome. Over the years I have put up many shower rods and never had an issue. Once unpacked I realized that this shower curtain rod was not a tension bar. Well, the designer could not have designed a more complicated shower bar than this one. It used 10 screws on each end. That's right! You have to tighten a total of 20 screws just to get this bar up on the wall. In addition to all those screws the bar is extremely flimsy and cheap so I am unclear why we need the equivalent amount of hardware that would be needed to secure the Brooklyn Bridge. And should you ever have to move it, well you know..... let's just say it might be easier to move than to replace. If you are looking for a shower curtain rod spend the extra 10 to 15 dollars and get a tension bar. It has only one screw to extend the bar to roughly the width of the area. Than all you do is twist the bar which tightens it some more until it is securely mounted. I have no idea why non-tension bars are even being sold these days. Whatever you do, do not purchase this bar unless you are looking for weekend project.